Orlando Attractions Update – Adding to it’s ability to host major sporting competitions, ESPN Wide World of Sports at Walt Disney World is about to start construction on a new state-of-the-art Disney cheerleading and dance team venue. Disney is planning to team up with the nation’s top cheerleading organization, Varsity Spirit, to create the first venue in the world specifically designed for cheerleading and dance team competitions. The venue will include a flexible design for one large competition space that can be set up for as many as four competition areas. Additional areas are being tailored for warm up and practice, along with areas for judges and officials. With the ability to seat over 8,000 guests, plus performance and warm-up space, the new multi-use sports and entertainment venue will also have the ability to host six regulation basketball courts, six regulation volleyball courts or concert configurations. There will be concessions throughout & an additional box office and entry to the complex. 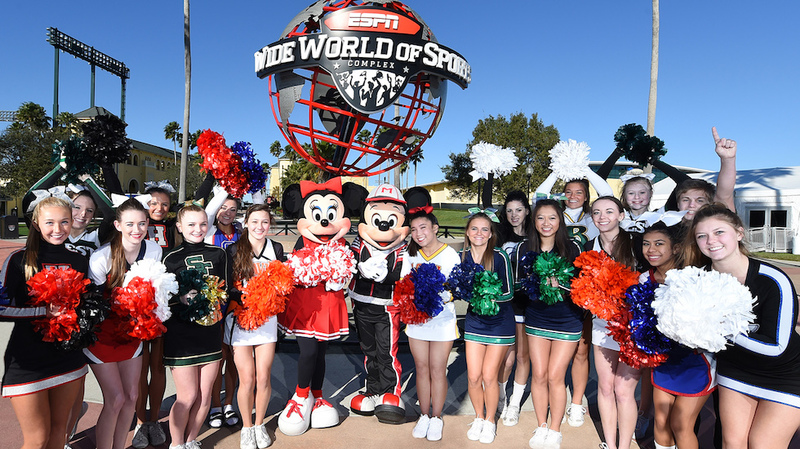 ESPN Wide World of Sports Complex and Varsity Spirit will continue to host cheerleading events at the complex, including Varsity Spirit’s annual National High School Cheerleading Championships. This event draws more than 650 teams from more than 30 states and is the only National Championship endorsed by the National Federation of State High School Associations. Winning a white satin National Champion jacket is seen as the pinnacle of success for thousands of cheerleaders from across the country. “Varsity Spirit invented the modern day cheerleading and dance competition, and we are proud to be the force behind this project, which represents our commitment to providing the very best and safest environment in the world for our athletes and coaches,” said Jeff Webb, Founder and Chairman of Varsity Brands. “Since this building has been designed specifically for spirit teams, we can’t wait to provide an even more high quality competition experience to thousands of athletes each year. With a growth strategy that will include more competitions and record-setting participation, this new venue will draw athletes, spectators and fans from around the country and provide an even stronger, positive economic impact on Central Florida. While the venue will primarily host cheer and dance competitions and volleyball and basketball games, the venue will also be incorporated into the numerous new sports and entertainment offerings at the complex. Construction is slated to begin on the Disney Cheerleading & Dance venue this month and is expected to take around 18 months to complete. Previous Post Universal Studios Hollywood Implements Demand Pricing – A Taste of Things To Come? Next Post EPCOT Announces Garden Rocks Lineup…..